Have a favourite brand? Quickly find the item you want! View cart “Casio FX-991EX ClassWiz Advanced Scientific Calculator” has been added to your cart. As a former Head of Mathematics, and a user of Casio calculators for over 40 years, I am confident that the fx-991EX is quite possibly the best classroom calculator they have ever produced. It retains the ease of use of the fx-83GT, but adds power and functionality that takes it literally to game-changing levels. Aimed squarely at the Secondary school market, and carefully featured to ensure that it stays within the parameters of public examination guidelines, this would be the calculator of choice for any student from Year 7 to Year 13 Further Mathematics. 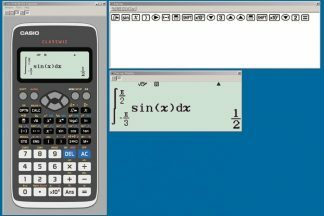 The only other calculator an A-Level student might need would be a graphical calculator, but the features of this one make even that an option rather than an essential. The incredibly high definition screen and multi-line display options make it easy to enter calculations and see answers in textbook style and clarity – be they with fractions, brackets, surds (roots), or any combination. The new Random Integer function makes it easy to simulate coin flips, dice rolls and even card selections or lottery draws, opening up possibilities for a huge variety of mathematical experiments and games. Factorising large numbers (up to 10 digits) into powers of prime factors with a single FACT command – amazing. Ratio calculations (example 3:10 is equivalent to ? :7) – the classic ‘Rule of Three’ which was an arithmetic nightmare to Victorian schoolchildren, is now just a tap away. Incredible power to solve equations and systems of equations or inequalities. The machine will solve algebraically any polynomial equation up to 4th degree (quartics). It can’t go higher because the general 5th power (quintic) is unsolvable – see Galois Theory! However, it can find a root for any general equation using Newton-Raphson to refine a user-supplied initial approximation. Similarly systems of simultaneous equations now go up to four equations in four unknowns. Also, by using the Inequality function on a quadratic, cubic or quartic polynomial, one can quickly find the points on the graph (if any) where it crosses the x-axis. The Solving and Inequality functions alone remove much of the need to turn to graphic calculators when working with graphs of polynomial functions. Matrices can now be input up to 4 x 4, with the calculator happily finding determinants, sums, products and even inverses. The previous limit was 3 x 3 matrices, although even this was sufficient to handle most exam questions. This was, for me, the main reason for my purchase. I can now finally dispense with my statistical tables – Binomial, Poisson and even Normal distributions are now covered completely. For example, one can calculate the probability that three coins out of five will show Heads (0.2734375); the probability that a person is taller than two standard deviations from the mean (0.05399096651); a two-tailed 95% Normal confidence interval (+/- 1.959964028) etc. All with a few taps – just entering the values and reading off the result. Note to CASIO – add in Chi-Squared values and you will have all the lab scientists and social scientists queueing up as well! Not content with its enhanced Table creation facilities (now supporting two functions f(x) and g(x) rather than just one), a basic Spreadsheet mode is also available, allowing input of formulae with both relative and absolute cell referencing, and display of either results or formulae in each cell. QR Codes – a QR code is generated by the calculator which can be read by a smartphone and used to display more information about the results via Casio’s own website (for example this might be used to display a graph of the calculator’s results). Razor-sharp display, powerful new functions and the same ease of use in an affordable calculator from one of the world’s most trusted calculator manufacturers make this the most highly recommended product for school use currently on the market. © Science Studio Limited. All rights reserved.